Charlene Badman from FnB knows all sorts of wonderful things. So when she suggested to Bob that he should find out about Gilfeather Rutabagas, he did one better and planted two rows of them. It is because of Charlene that we grow Sun Gold Tomatoes (Aidan’s favorite) and Spigariello (which has become a market favorite). She just seems to know these things. 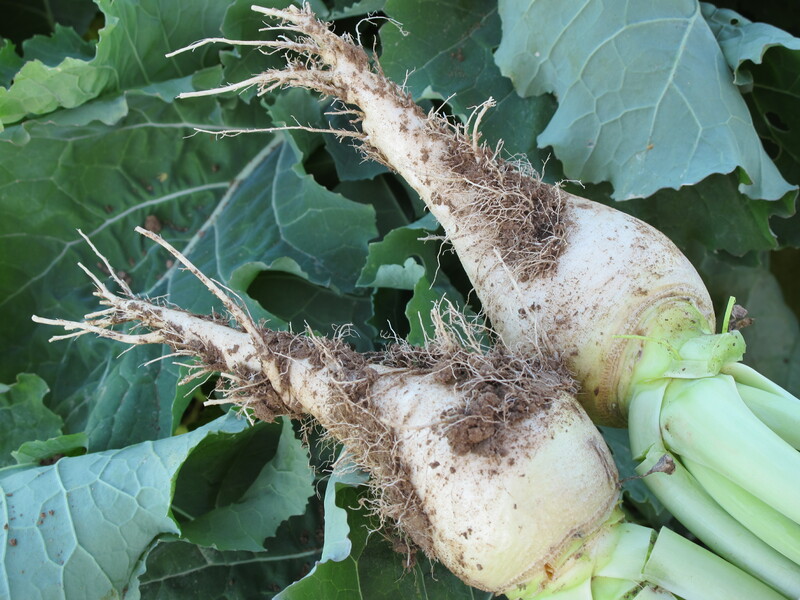 Have you heard of a Gilfeather Rutabaga? Probably not and there is a good reason for that. Charlene discovered these at the Green Market when she was living in New York. The Green Market has farmers and vendors from all over New England who make the trek into Union Square with their sundry of items. If you haven’t been, it is quite a sight to take in all of the beautiful produce while standing in the midst of skyscrapers and crazy taxi cabs. These rutabagas are traced back to John Gilfeather, a farmer from Vermont, who was known in the early 1900’s for growing turnips. He originally named these Gilfeather Turnips. But, as anyone can see, these are definitely not turnips. Whether he knew that or not, isn’t clear. What is definitive, is that these Gilfeathers are uncommonly tender and sweet, and that the long Vermont winters only increased their sweet flavor. John Gilfeather understood that he had something unique on his hands, and went to great lengths to protect his namesake and corner the market on his rutabagas disguised as turnips. He would trim the greens from the top and trim off the bottom roots to prevent propagation and kept the seeds for himself. It is rumored that after his death, Gilfeather’s neighbors went into his fields and took plants so they too could grow Gilfeather Rutabagas. The seeds are still difficult to get, but the legend lives on. In Vermont, it is one of only two vegetables registered as an heirloom by the state. There is even an annual Gilfeather Turnip Festival in Wardsboro where local chefs offer a variety of delicacies made from the Gilfeather, serving it in everything from breads and cakes to soups and souffles. Clearly the rutabaga/turnip controversy lives on. 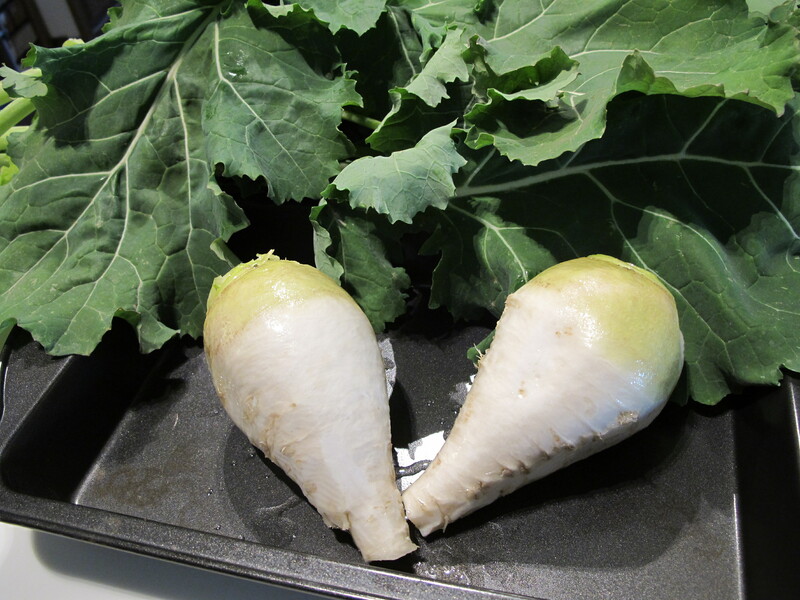 So, what can you do with a Gilfeather Rutabaga? When Charlene came out earlier this week to see how they were doing, she helped pull the first few from the ground. Her recommendation was to roast them – and then smash them! Smashing them releases the sugars. She then says to saute and roast them again briefly to allow the sugars to caramelize. Marsha and I both tried this that evening and could understand exactly why Charlene suggested Bob learn about Gilfeathers. They are wonderful! We just started growing them, so they are in limited supply and Charlene has first dibs on these guys. But I would highly recommend that you go to FnB and try them from the expert herself. Clean, peel, and trim the top and bottom off of the rutabaga. Roast with a little olive oil in the oven for about an hour. The rutabaga should soften enough to pierce with a fork, but not become too mushy. Saute for a few minutes on the stove top and then put back in the hot oven to brown and allow the sugars to caramelize. Serve warm with a little sour cream or creme fraiche on the side. Where does one source Gilfeather rutabaga seed? Fedco Seeds in Maine has the Gilfeather Rutabaga seeds. I found these at the Union Square Greenmarket, and they were so pretty that I bought a couple. I followed your recipe, except I didn’t bother with the sauteing step. Just wrapped in parchment while they were still hot and smashed them with the bottom of a pan. I popped them back in the oven to brown. Absolutely delicious. I will be seeking these out again, and wish I had a garden to plant some in.